Approximately every third patient suffers from depression after a blood clot or haemorrhage in the brain (apoplexy). This has consequences in the shape of reduced daily activity level and increased mortality. 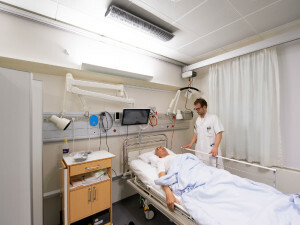 Since 2013, a Danish research project at the apoplexy unit of the neurological clinic at Copenhagen University Hospital has worked on studying whether Circadian Lighting is of any consequence for apoplexy patients hospitalised for rehabilitation. ”For hospitalised patients, it can be a great challenge to maintain a natural circadian rhythm. Patients hospitalised for rehabilitation after a blood clot or brain haemorrhage are often immobile and do not go outside and thus do not get the daylight that the brain needs in order to achieve a stable circadian rhythm, explains Doctor Anders West from Copenhagen University Hospital. In cooperation with the lighting company Chromaviso, the research group and the operations department from Copenhagen University Hospital have developed a Circadian Lighting designed to maintain the natural circadian rhythm by imitating the natural sunlight during the day and thus creating the necessary combination of light changes and darkness over 24 hours. In a PhD project, Doctor Anders West has studied the effect of natural circadian lighting on patients’ health at the apoplexy unit’s department for rehabilitation after a stroke. This project is the first study internationally to measure the effect of Circadian Lighting on hospitalised apoplexy patients. 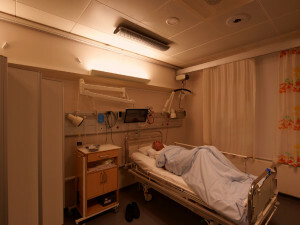 It is a randomised clinically controlled study with a total of 90 included patients, of which half of the patients were treated on a ward with installed Circadian Lighting and the other half, the control group, were on a ward with standard lighting. The effect of Circadian Lighting has been studied with regard to a number of parameters, including sleep, circadian rhythm markers, cognitive abilities, anxiety and depression. The first results have just been published at the ”International Stroke Conference” in Houston, Texas. Here, it was submitted that patients on the ward with Circadian Lighting had significantly fewer depression symptoms when they were discharged compared to the patients from the control group. The depression degree of the patients was measured when they were admitted as well as when they were discharged after at least 2 weeks of hospitalisation. The Hamilton Rating Scale for Depression and The Major Depression Inventory Scale were used. The effect of Circadian Lighting on patients’ sleep and fatigue as well as the circadian rhythm dependent transmitter substances will be published at the “European Stroke Organisation Conference” in May this year. Link to abstract here. ”The study shows that Circadian Lighting counteracts or effectively treats depression that has occurred in connection with a blood clot or brain haemorrhage. In the future, Circadian Lighting should be considered as part of the treatment environment in connection with courses of rehabilitation lasting more than two weeks,” explains Anders West. In order to maintain the circadian rhythm, it is necessary to receive stimulation from light – particularly the blue spectrum during the day, but it is equally important to avoid light stimulation at night, which can be a challenge at a hospital. Therefore, the stimulating blue light has been removed from the evening/night light, thus uniting the patients’ need for the necessary light spectrum with the staff’s need to see and be able to carry out the various tasks during night and day. It requires special technology and in-depth knowledge to unite these needs in a coherent and effective circadian rhythm design. ”In cooperation with Chromaviso, we have developed a light protocol that is adapted to the patients. The light protocol outlines the precise interaction between the colour temperature, intensity and duration of the light during the day and night,” explains Anders West. In 2013, Copenhagen University Hospital and Aarhus University Hospital started working together with the company Chromaviso on developing and documenting research-based circadian lighting. It is a cross-disciplinary, public-private cooperation with support from the Market Development Fund. The lighting solution of the research project is called Chroma Zenit Circadian Lighting and has been developed by the Danish health-technological company Chromaviso in cooperation with researchers and the clinical staff at Copenhagen University Hospital and Aarhus University Hospital. It is based on a combination of insight into clinical everyday life, knowledge about the effect of the light on people and competences within circadian rhythm products and technology. Chroma Zenit Circadian Lighting includes a light protocol that creates the natural and steady rhythm between light and dark during day and night in order to ensure a health-promoting physiological effect, the stable circadian rhythm and the right balance between sleep and waking state. Furthermore, Chroma Zenit Circadian Lighting includes situation-specific light settings for various activities and needs. A night light free from blue light means that everyone can move safely around and carry out various tasks without the circadian rhythm being affected. It is a clinical study with 90 patients with intervention as well as control. The results will be published on an ongoing basis in 2017 as a PhD project by Doctor Anders West. The first result was published at the International Stroke Conference, in Houston, Texas, showing a significant effect with regard to reduction of depression. All departments above from the Copenhagen University Hospital.